The Ultimate Weapon – General Avionics, Inc.
Like thunder, he lunges into battle. He carries 185 pounds of combat equipment, for he is ready to fight and protect his country. He has been a symbol of the infantryman, the Ultimate Weapon, for more than 40 years. In 1957, the mission was assigned to build a statue. Now retired Command Sgt. Maj. Billy L. Wright, a Willingboro resident, was chosen to oversee the creation of the symbol of the Infantry. "It started out as a small project. We had no idea it would turn out so big and last so long," Wright said, reminiscing about the time spent creating the statue. The project began, according to Wright, with Spec. 4 Steven Goodman, a clerk who worked under him. "He had a natural talent to create things with his hands," Wright said. At the time, the post was an infantry post - a place for foot soldiers to receive basic and advance training. 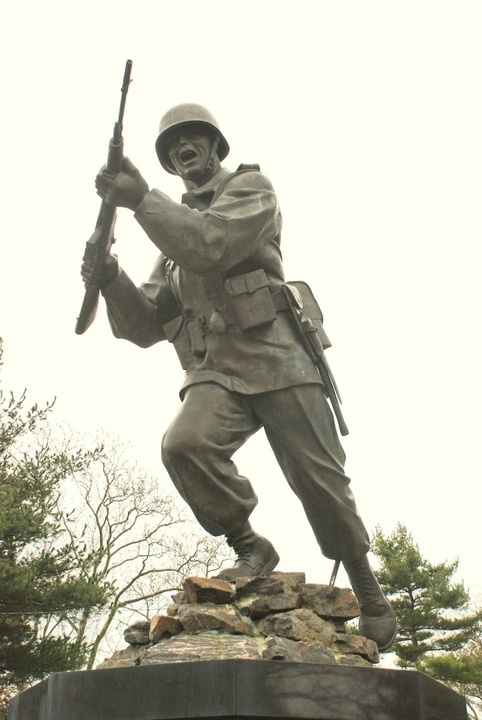 Post Commander Bruce C. Clarke told Wright he wanted a statue for Fort Dix that would be a symbol of the infantryman. "They said they were looking for something that was exciting. They told us that the infantryman was the ultimate weapon. They said the Army can create all kinds of bombs and weapons, but it takes the infantryman to go in and hold the ground," Goodman said. Because the Army did not have a budget for artwork, supplies were scarce. 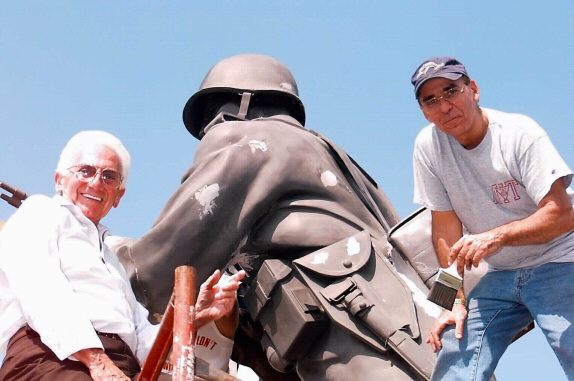 "I built the original statue with an old railroad track and odds and ends," Goodman said. He was assisted in the construction by Pvt. Stuart Scherr, who had studied industrial arts with him in New York City. After working 10 to 12 hours a day for 18 months, the job was finished, and so too was Goodman's enlistment. He returned to the civilian world, and eventually founded his own importing company. For years, he almost forgot about the statue. Then in 1989, Goodman's son wanted to stop on the way to Philadelphia to see the statue his father had built. "We went there and I pointed out the area where it had been, but it was gone. I said they probably knocked it down and threw it into the garbage and that was that," Goodman said. But his wife suggested they stop at Post Headquarters and see what happened to it. Goodman stopped a passing soldier. "Hey fella, what ever happened to the Ultimate Weapon?" 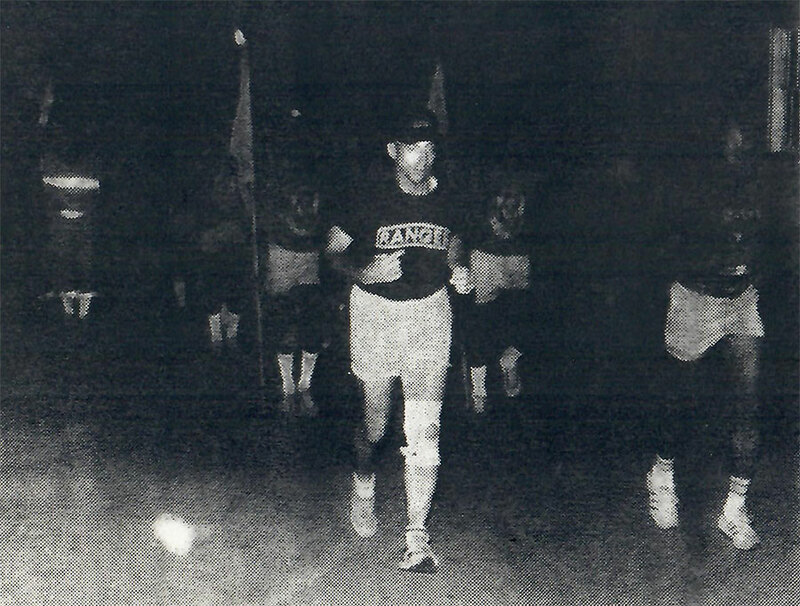 Goodman said the soldier was startled; "It was Maj. General James W. Wurman, the post commander. I guess he wasn't used to people around there calling him fella," Goodman said. "The general asked me why I wanted to know. I told him I had built it, and I wanted to show it to my kid. "He said, 'Where have you been? We've been looking all over for you. 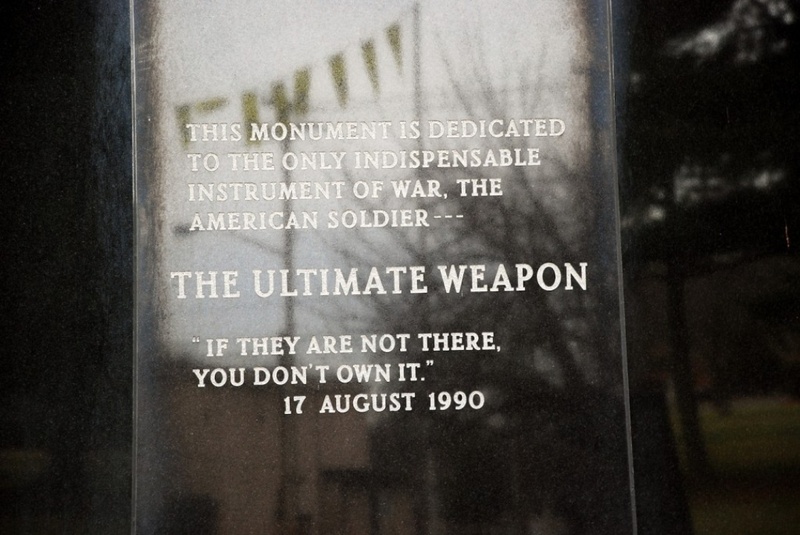 The Ultimate Weapon has become the symbol of the American fighting man.'" The general asked for Goodman's help in restoring the statue. Goodman traveled about once a month to Fort Dix from his home in Cresskill in Bergen County to meet with the restoration committee, formed under the sponsorship of the Fort Dix Chapter of the Association of the U.S. Army. 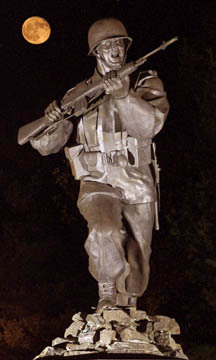 Summer heat and winter cold had taken its toll on the original statue, and although some repairs were made, it was decided that the symbol of the Infantry needed recasting. The original was taken to a foundry near Princeton in 1988, where molds were made for recasting the statue in bronze. 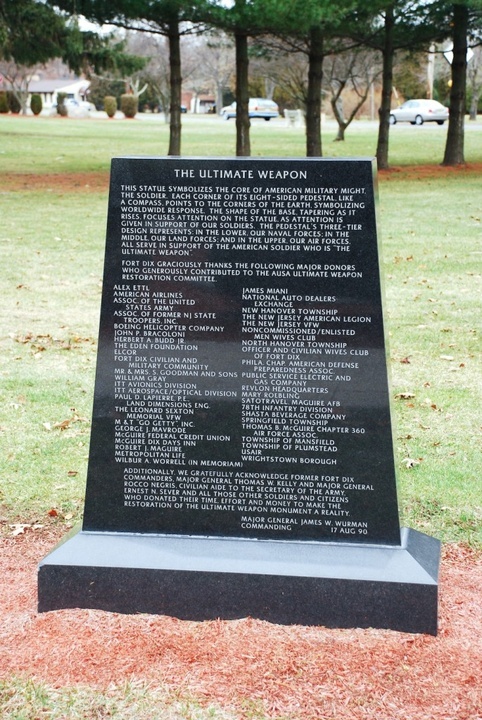 The statue was then taken to a temporary home in the center of the then Fort Dix Reception Station (today the USAF's Air Mobility Warfare Center) and is now at Sharpe Field. Goodman said he put a lot of his own time and money into the project, but that was not what was important to him. "I take great pride in what I had done. I wanted to make sure it came out right." But Goodman is only one of many who contributed to the estimated $86,833 project cost. 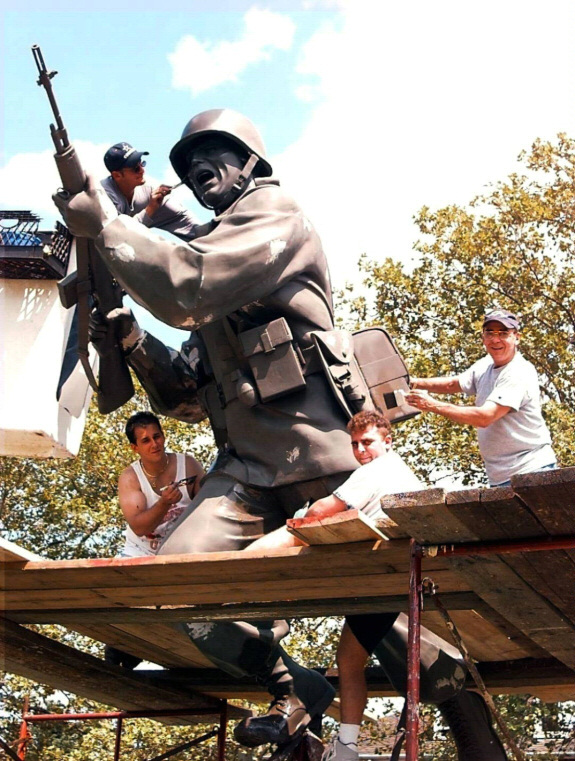 Fort Dix worked on a major fund-raising campaign and raised more than $80,000 for recasting of the statue. News of the restoration also reached the private sector, and donors contributed more than $25,000 to the fund. According to Wright, the statue has been a success because it doesn't show a single race, creed or religion. "It's a symbol to be recognized," he said. 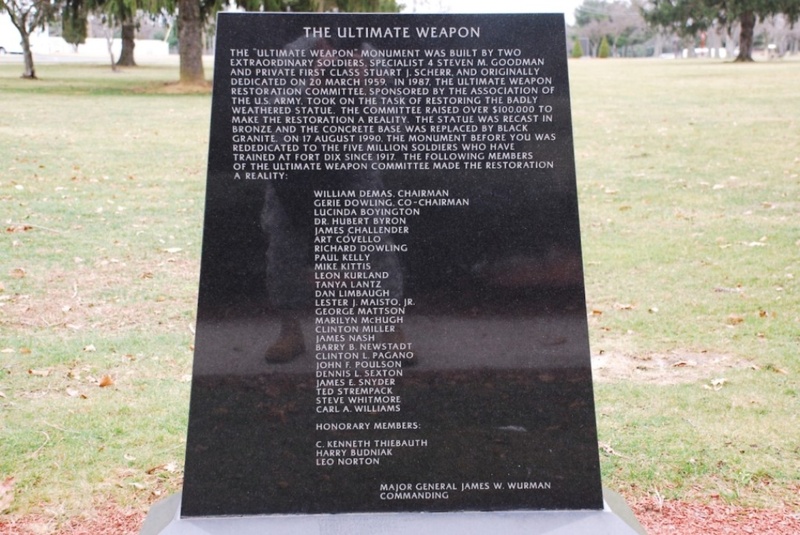 Located in Infantry Park, the newer statue, which stands 14 feet tall and weighs over 300 pounds was unveiled in August of 1989 and continues to be a symbol of excellence at Fort Dix. Fort Dix H.Q. now named Wurman Hall. Memories of an early morning run. 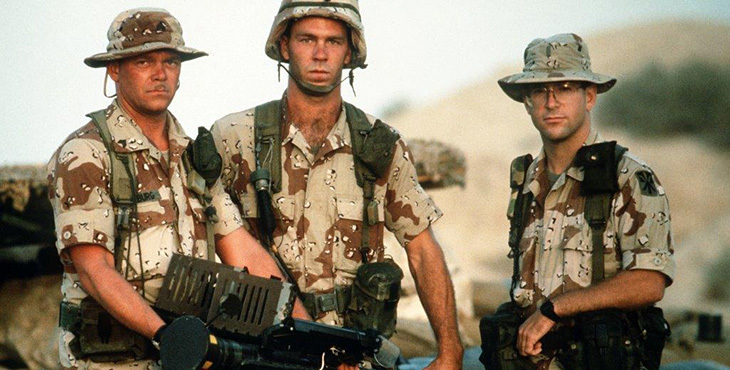 What were you doing in the service 25 years ago? Copyright 2018 by General Avionics, Inc.